Fifty years ago, on November 22nd, President John F. Kennedy was assassinated. It was a nationally televised horror that marked the start of turbulent times. The years that followed were tumultuous to say the least. Three and a half years later both Dr. Martin Luther King Jr. and Robert Kennedy were gunned down. During this time the Vietnam War escalated, the civil rights movement gained momentum and carnage, and all of it was televised. In families rooms across our nation the evening news showed people burning in an obscure Asian country and American cities burning. It was a chaotic and troubling time in which the status quo (those over 30, non-minority and male) lost their footing. The world they helped to build and were promised by their parents was slipping away. Throughout the devastation, or maybe even because of it, good things began to grow. Tiny saplings such as ecology, feminism, and reproductive rights began to appear amongst the ruins. The civil rights act did get signed, after a shamefully long wait and unforgivable amount of violence. There were strides in the women’s rights movement, though not a passage of the E.R.A. (Equal Rights Amendment.) The E.P.A. (Environmental Protection Act) went into effect in 1970 (as did Earth Day.) There was enough momentum to assume that the tide had turned somewhat. This progress happened in a very visible and even audible way. Fashion followed what was happening on the streets. Shirts and home decor featuring “protest posters” were for sale. Slogan T-shirts began to appear. All of this to the background of some rockin’ protest themed music. Even the softer rock songs were dotted with anti-war or anti-establishment themes. Their sound told you there was something going down. It seems (from the distance of 50 years) that it all stopped as suddenly as it started. It’s tempting to look to Watergate as what doused the fire. Leaders being assassinated in their prime causes hurt and fear, leaders abusing power and lying causes disgust and apathy. The equation was probably a bit more complex than that. Those who were directly impacted by the events of the early 1960s (and of an age to take it to the streets) had gotten older and perhaps had moved on. Some, no doubt saw their fights as having been won and moved on. Others kept up the fight but within the system and off the streets and out of the spotlight. Whatever the exact formula the result was that the counter culture dissipated and the protests petered out. Nothing of that fevered pitch can last. But isn’t it odd that it’s never returned? Surely there has been enough horror and inequity to stir rebellion. A 10-year war in Iraq? How about protesting that unlike Viet Nam it’s never been televised? The erosion of reproductive freedoms, the rise of poverty and unemployment and racial unrest (which is what the immigration debate really is) seems suitable for protest. We’ve never had more tools for organizing and yet we seem so disorganized. There are energetic and impactful demonstrations that happen all the time. But they are fragmented and you’d be hard-pressed to identify leadership by name. You’d have to really strain to come up with a popular song with political themes. There have been great political strides made, most notably in gay rights, in recent years. But that victory was over 40 years in the making. Trends come and go, life ebbs and flows, but do people really change? There has been so much violence, corporate corruption and political deceit in the last decade to spark something, no? 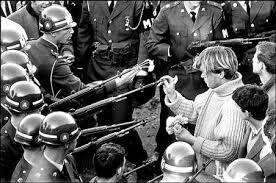 Or was the outpouring of political engagement and protest of the 1960s a moment in time? Was it tantamount to the Industrial Revolution or the Roaring Twenties? It’s something to think as we approach a dark anniversary.